Alex Hem '16 (left) participated in a living laboratory study led by Jose "Memo" Guillermo Cedeño Laurent, a researcher at the Harvard T.H. Chan School of Public Health, to monitor student wellness, sleep, and fitness habits within the built environment. The research has received two Climate Change Solutions Fund grants. Healthy buildings and clean air keep people healthy. That simple premise is driving a series of studies being conducted by Harvard researchers, some of which have gathered insights from University dorms and office buildings. It is part of a multiyear partnership between the Office for Sustainability and the T.H. Chan School of Public Health’s Center for Health and the Global Environment to use campus spaces to inform public health research and apply the findings in capital projects and renovations. 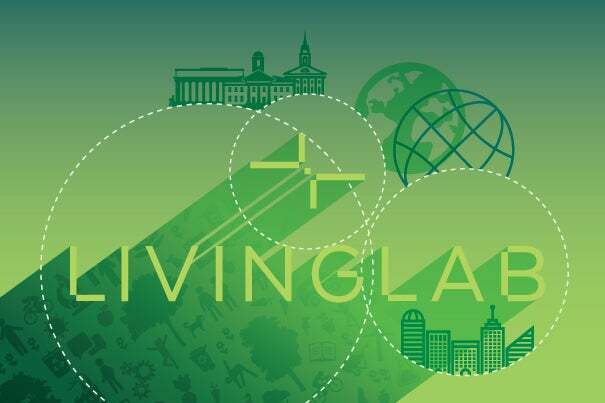 This partnership and another involving faculty and students working to reduce greenhouse gas emissions are being hailed as models for the type of collaborative work that the University wants to stimulate as it launches a reinvigorated “campus as a living laboratory” initiative. The effort will support projects that use the campus as a test site for developing solutions that enhance well-being and mitigate climate impact, or help neighboring communities tackle these problems. The outcomes will be specifically designed for sharing at local, regional, and global levels. A $200,000 Campus Sustainability Innovation Fund to support undergraduate and graduate student research that addresses sustainability challenges, including but not limited to climate and health. This builds on an existing Student Sustainability Grant program that provides seed funding for students to pilot their creative ideas. Wendy Jacobs, clinical professor and director of Harvard Law School’s Emmett Environmental Law and Policy Clinic, will lead the Living Lab Course and Research Project, which is designed to bring together students from across the University in interdisciplinary teams to develop innovative approaches for reducing greenhouse gas emissions at Harvard and beyond. The strategies will be scalable for consideration and potential adoption by other similarly situated institutions and enterprises that want to reduce their emissions and improve public health in and around their buildings. This interactive course will include lectures from faculty experts representing most of Harvard’s Schools, including the T.H. Chan School of Public Health, John A. Paulson School of Engineering and Applied Sciences, Harvard Business School, and Harvard Kennedy School. Ideas developed by the student teams will be vetted with policymakers, community leaders, and business leaders during the semester. Some of the project ideas subsequently may be implemented by students in the Emmett Environmental Law and Policy Clinic, which is also open to cross-registrants from across the University. “We will afford students from across the University a unique opportunity to collaborate, to learn from each other, and to hear from distinguished faculty from a variety of disciplines,” said Jacobs. One task for students will be to assess and analyze tools for choosing off-site emissions reduction projects as a means to achieving long-term climate neutrality commitments by businesses and organizations. The course was a key recommendation of a faculty advisory group convened to explore ways to meet Harvard’s 2006-2016 greenhouse gas reduction goal. Findings will specifically be used to inform the University’s approach to coupling off-campus emissions reduction opportunities with on-campus efforts in order to meet its ambitious, long-term climate commitment. “Climate change and ultimately sustainable development are global issues that touch every part of life, and as a university with a broad and diverse faculty we have a role to play in piloting new ideas that can be widely replicated well beyond the boundaries of our campus,” said Heather Henriksen, director of the Office for Sustainability (OFS), where the living laboratory initiative will be housed. The Campus Sustainability Innovation Fund (CSIF) will provide funding for research assistantships and independent research projects that tackle real-world challenges on campus or in the community, and lead to the practical application of emerging technologies or strategies that can be used to inform the University’s implementation of its five-year Sustainability Plan. Projects supported by the CSIF must have an identified faculty sponsor and map directly to one of the goals, standards, or commitments in Harvard’s Sustainability Plan. Special consideration will be given to projects that take advantage of the power of multidisciplinary discovery or that focus on climate change or health and well-being. A Climate Change Solutions Fund Faust established to provide grants to faculty research exploring low-carbon innovations already gives special consideration to projects that propose using the campus as a living laboratory. “The University’s innovation ecosystem is well prepared to help envision and support the creation of the tools, technologies, and solutions needed to act on climate change and enhance public health, and these new programs will only help accelerate those efforts,” said Jodi Goldstein, Bruce and Bridgitt Evans Managing Director at the Harvard Innovation Labs. An advisory group will provide ongoing guidance to OFS on the management of the CSIF. Its members include Matthew Guidarelli, assistant director for social and cultural impact at the Harvard Innovation Labs; Leah Ricci, assistant director of sustainability and energy management, Harvard Business School; Professor William Clark, Harvard Kennedy School; and Professor Jack Spengler, Harvard T.H. Chan School of Public Health. Atop the roof of the Science Center with solar panels in the background, SEAS/EPS Professor Michael McElroy talks about his new book, “Energy and Climate: Vision for the Future,” on the global energy challenge with climate change.